The new pack will provide you with fresh and unique voices. This add-on for MorphVOX Pro - Voice Changer lets you sound like old and wise Albert, squeaky Mary Jane, goofy Clarence and more. Voices in this pack include: Albert, Clarence, Edith, Jake, Mary Jane, and Sabrina. 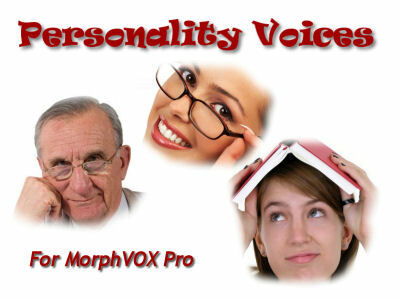 This free add-on for MorphVOX Pro - Voice Changer will add comedy to your instant messaging and voice-overs. Note: This add-on requires MorphVOX Pro version 3.4.16 or higher. You will need to upgrade to this version to uses these voices. Check out the Fun Voices! Note: You may not sound exactly like the examples. Voice changing results with Personality Voices may vary from speaker to speaker.